Periodontal disease (or “gum disease”) is an infection caused by bacteria in the mouth that are found in plaque around teeth. 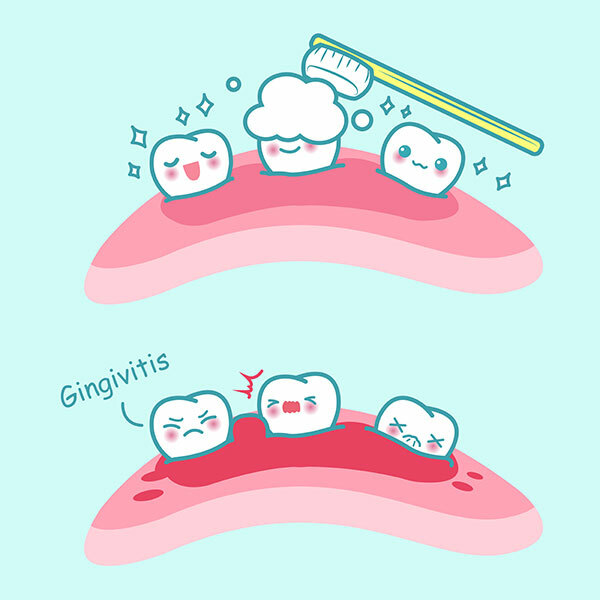 When the bacteria spread below the gum line, the gums can develop swelling (known as gingivitis), and if left untreated, the infection can become more severe and the bone supporting the teeth can begin to break down and dissolve (which is known as periodontitis). This can cause weakening of the hold of the teeth by the jaw bone, which can cause the teeth to become loose, and potentially result in the loss of teeth. Also, with time, plaque can form into a harder substance called calculus, which cannot be removed by brushing or flossing, and requires treatment by a dentist or dental hygienist in order to remove it. Brushing and flossing daily will fight bacteria and can help prevent gingivitis, as food debris and plaque are removed by good oral hygiene practices and keep the surfaces of the teeth clean. Home care will not be effective in the case where plaque bacteria accumulate below the gum line: the inside of the gum pocket will become infected if not given sufficient treatment. If left untreated, the adjacent soft and hard tissue will break down, forming a deeper pocket in the process. This is why dental hygiene is such an important component of oral care: a dental hygienist uses specific instruments that can reach below the gum line to access plaque and calculus that may accumulate around the teeth. Dr. Trotti and his dental hygiene team will examine you to determine if a regular oral care maintenance schedule, soft tissue management program or referral to a periodontist is the best form of treatment for you. Soft tissue management is a non-invasive personalized plan at reasonable cost which aims to reduce infection of the gum and root surfaces, and is performed by a dental hygienist. This personalized hygiene dental program includes professional oral care cleanings to remove harmful deposits, antibacterial treatment to help kill bacteria, home care education and close monitoring. Gingivectomy – This procedure is done to remove extra gum tissue which may be overgrown on or over the teeth in order to provide improved access to the teeth in order to keep them clean. Dr. Trotti frequently uses a laser instrument to remove the excess gum tissue, which allows the procedure to be done without any bleeding or need for suturing. Frenectomy – A frenum is a section of tissue in the mouth that helps keep the tissues of the lips and cheeks fixed in place. In some cases, a frenum may overgrow, which can affect the appearance of a person’s smile. Dr. Trotti frequently uses a laser instrument to remove the overgrown tissue, which allows the procedure to be done without any bleeding or need for suturing.